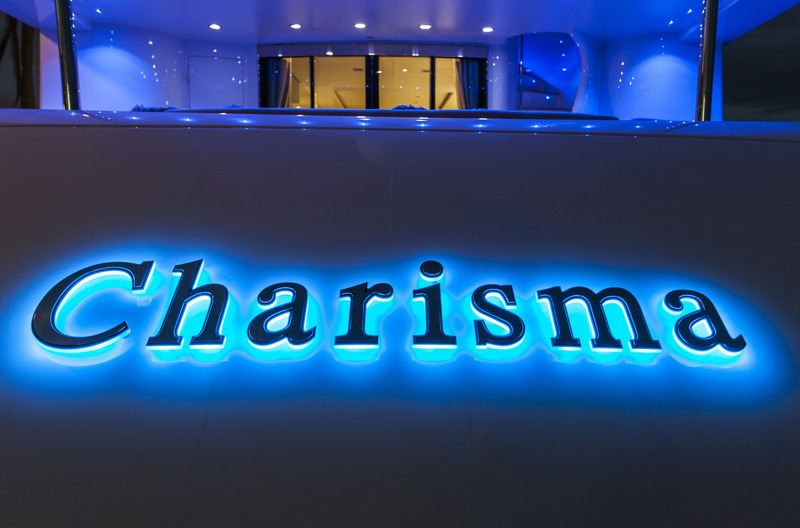 Luxury motor yacht CHARISMA was launched in 2005 by the European shipyard DMC (Danube Marine Consultants). 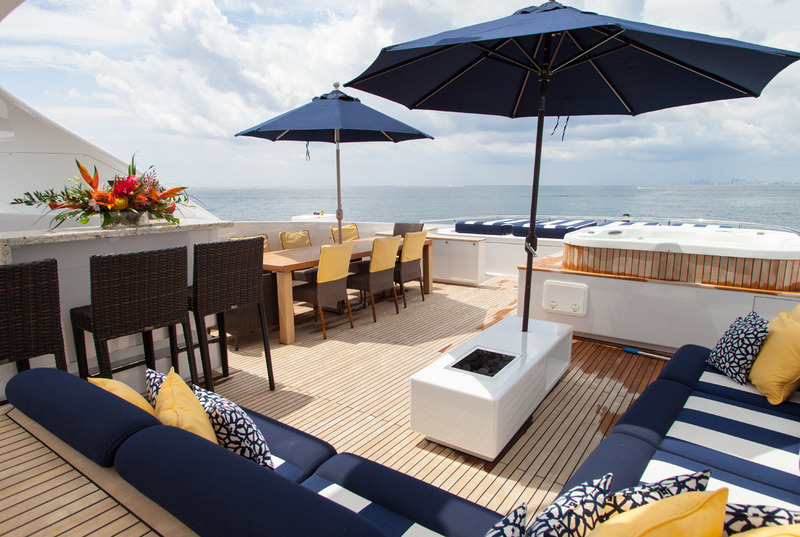 She features naval architecture by Dutch-based Frank Mulder and interior design by the USA’s Egg & Dart. 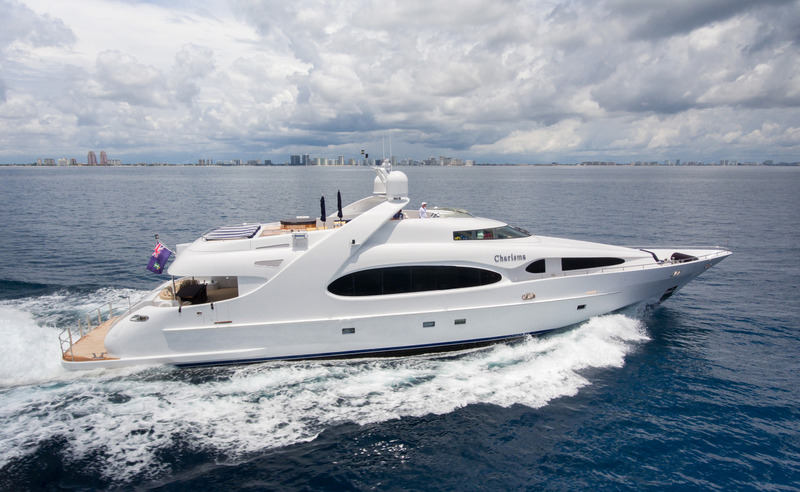 Measuring 36.58m (120ft), yacht CHARISMA offers yacht charter accommodation for eight guests in a Master cabin, a VIP cabin, a double cabin and a twin cabin. 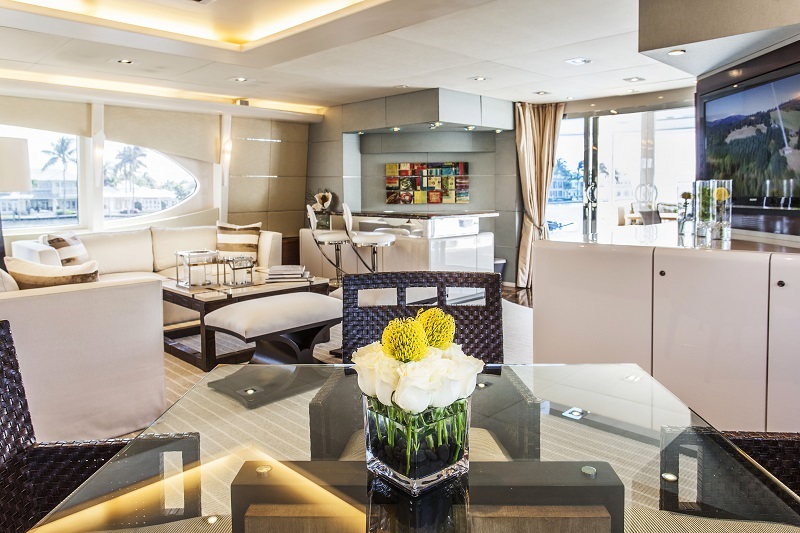 The décor aboard the CHARISMA motor yacht is bespoke, emphasizing earthy tones and neutrals, creating a relaxed, elegant ambiance. 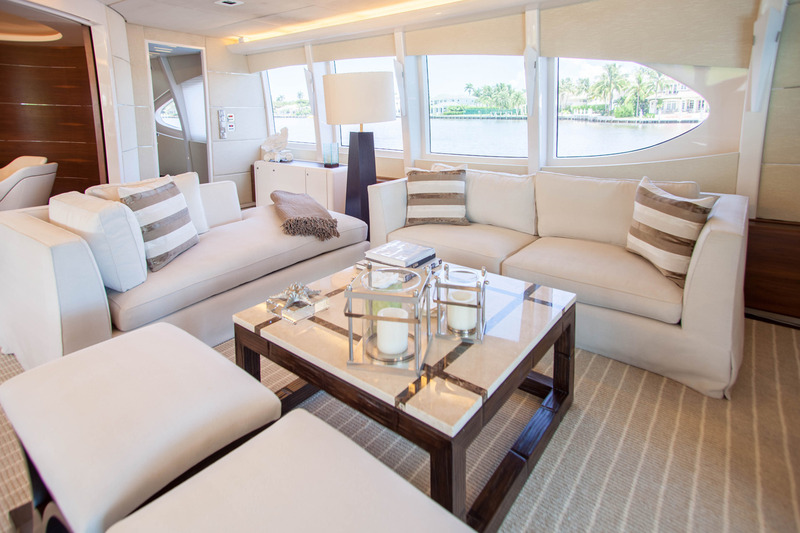 The salon is an open plan offering a marble-topped wet bar and spacious lounge aft, with a games table to port and the formal dining area forward. 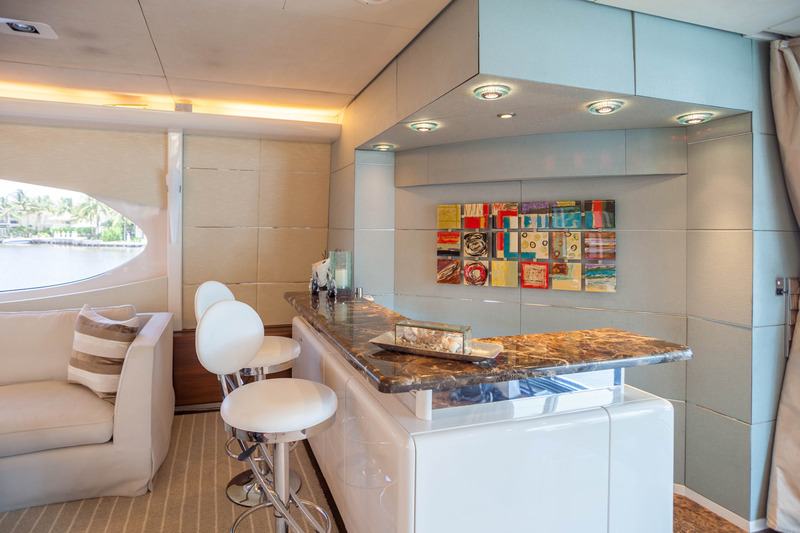 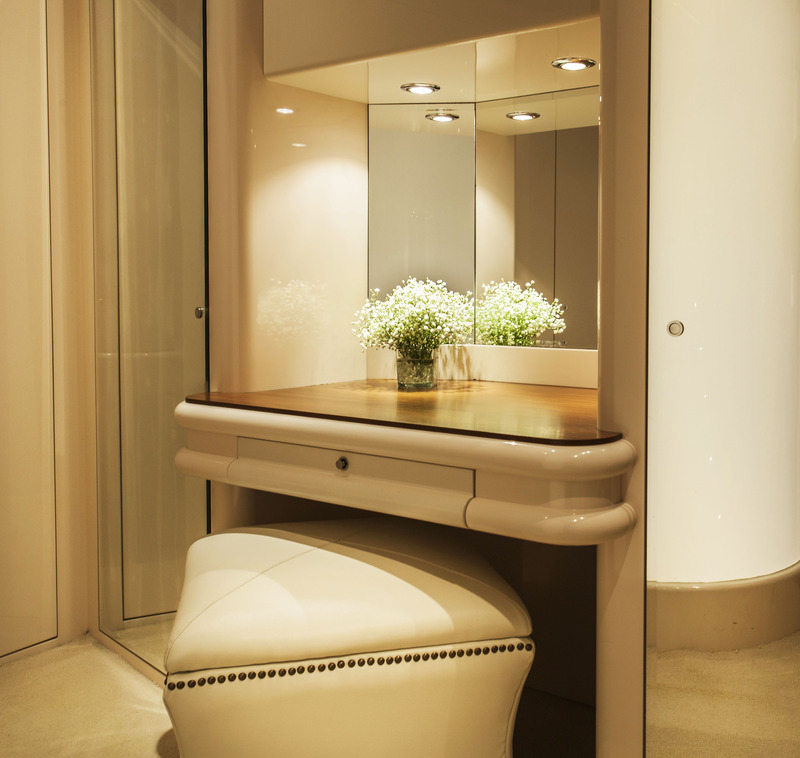 An innovative feature envelopes the formal dining area, enclosing it from the well-appointed galley, allowing guests to retire to the salon after a meal, uninterrupted of crew duties. 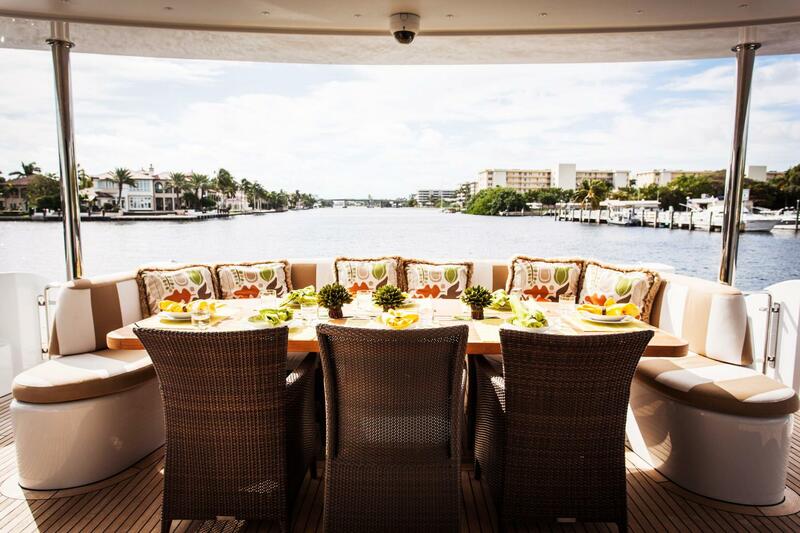 Forward to the salon and raised, is the pilot house, while forward on the main deck is the full beam master stateroom. 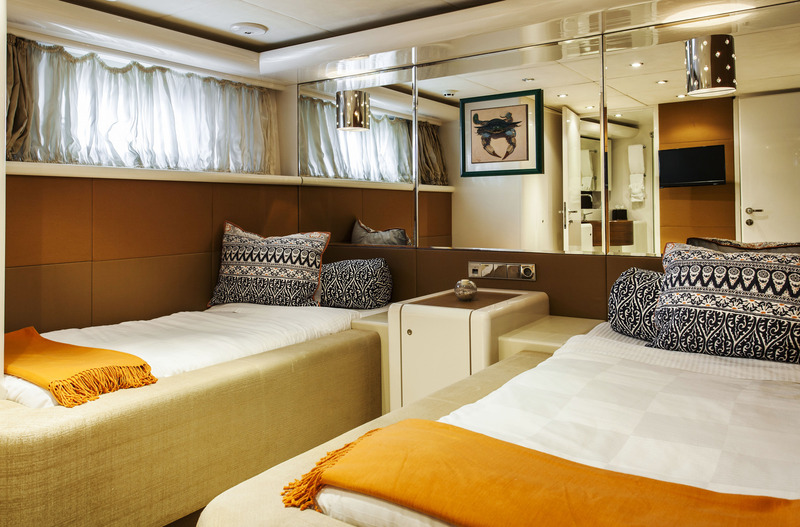 Further guest accommodation is below decks in 3 en-suite cabins. 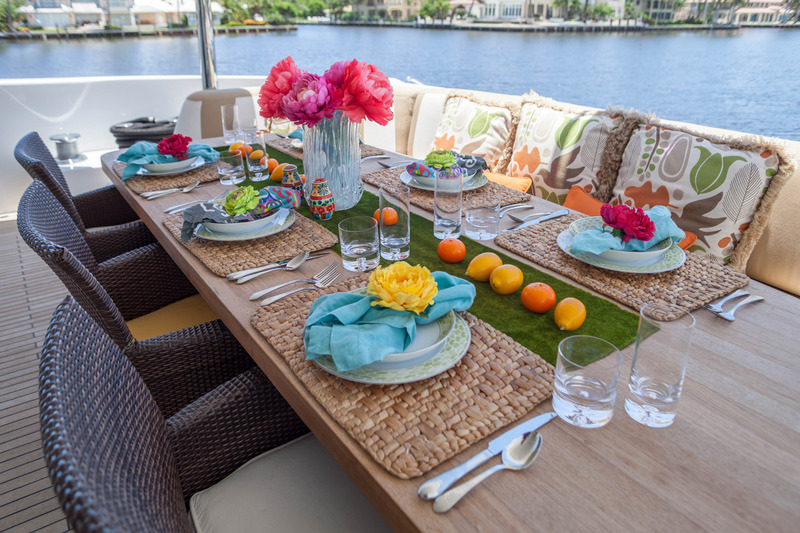 Crewed charter yacht CHARISMA offers ample exterior living on two levels of luscious teak decks. 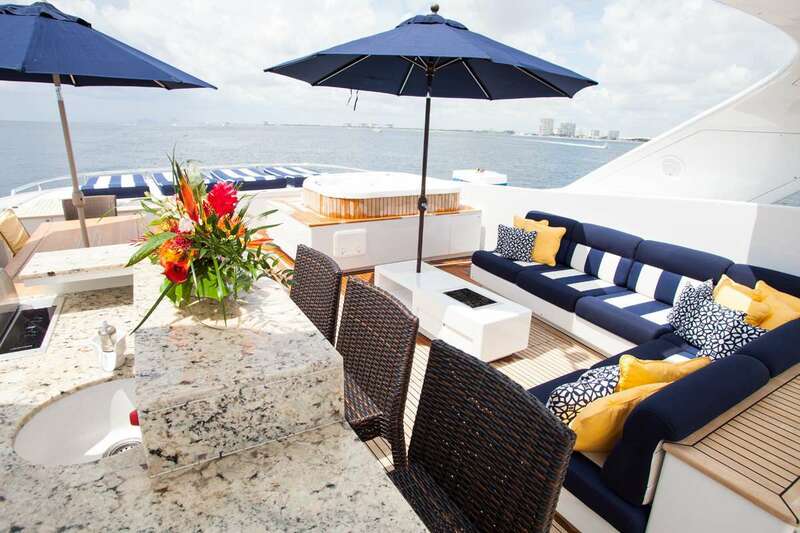 The aft deck is adjacent to the salon and shaded, with plenty of seating and an alfresco dining option. 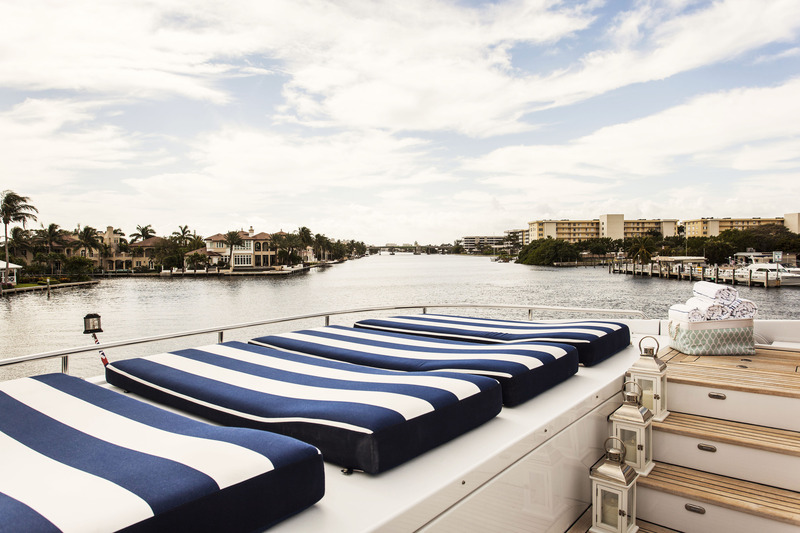 An extended swim platform with stainless steel rails is the perfect area to enjoy the waters and sea toys on offer effortlessly. 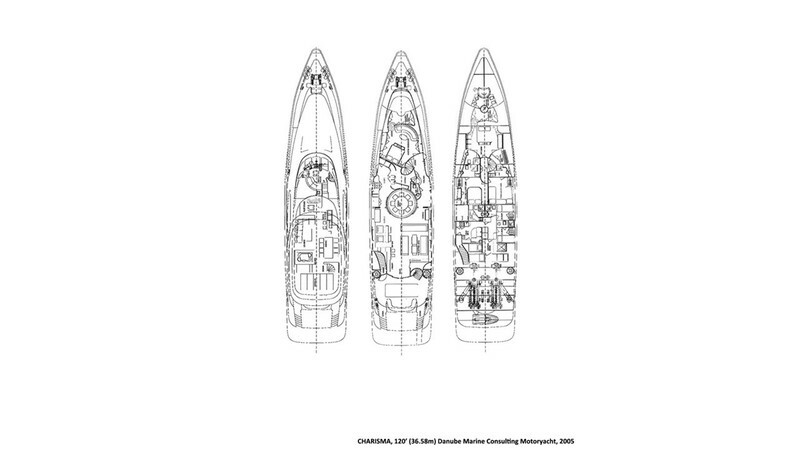 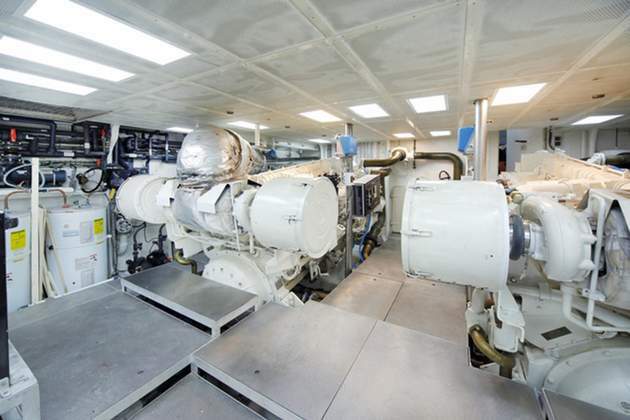 The upper deck is accessed from the interior pilot house, or from the aft deck, via a sweeping staircase. 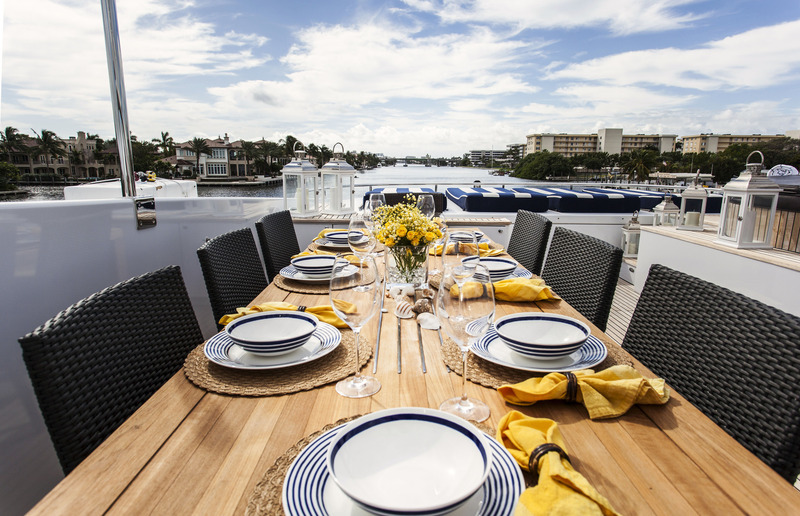 The upper deck is fabulous for entertaining, boasting a complete wet bar and service area, seating, alfresco dining option and raised sun pads. 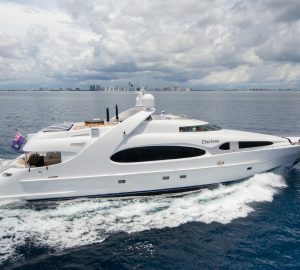 Powered by 2 CAT x 2,600hp engines, CHARISMA is capable of 16 – 21 knots. 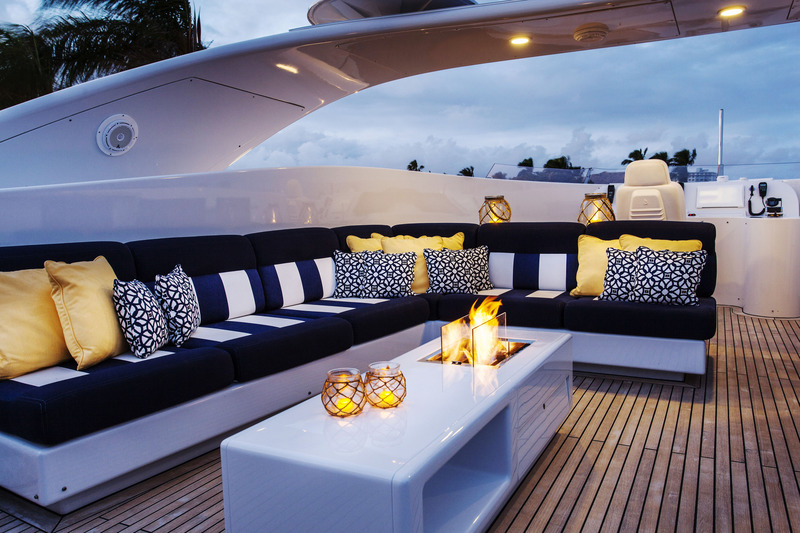 The yachts eye-catching hull design is fast, her shallow draft of 1.8m (6ft) makes her the perfect choice for cruising in shallow waters. 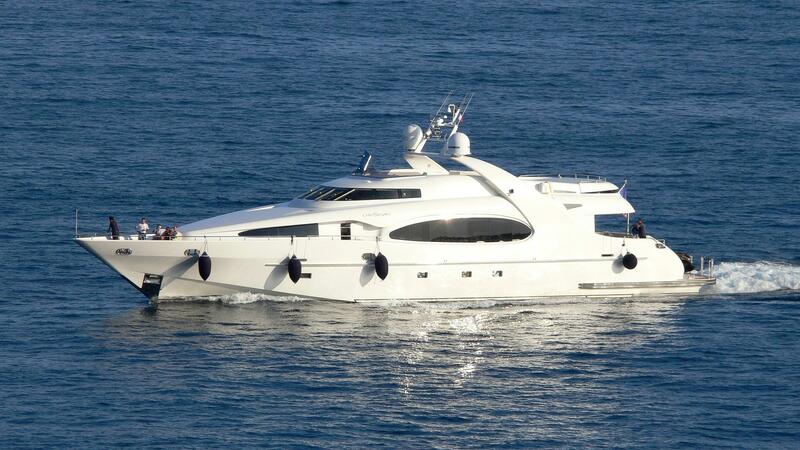 M/Y CHARISMA can accommodate up to 8 charter guests in 4 en-suite cabins. 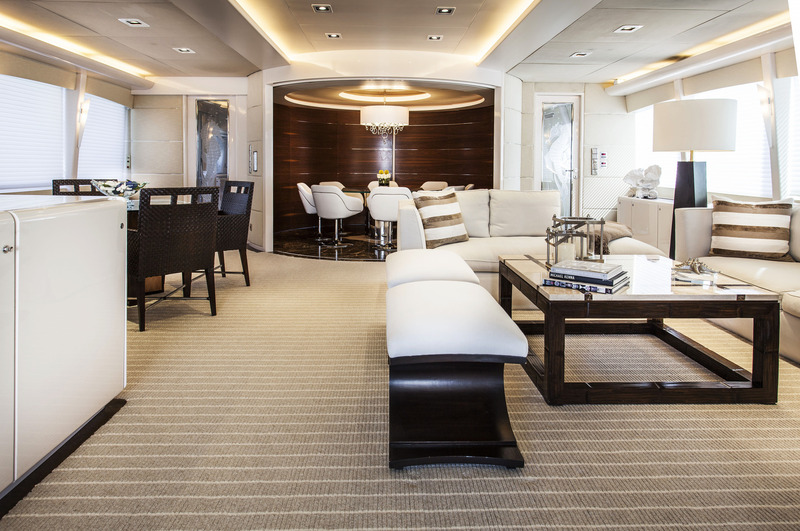 The master stateroom is on the main deck forward of the salon, with a full beam layout. 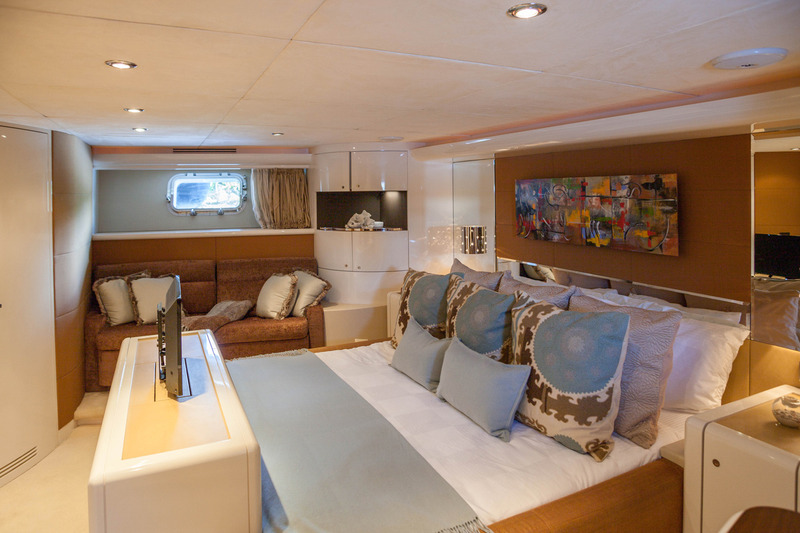 The master cabin boasts a king size bed and large lounge area, forward and lower is a full changing area and generous en-suite. 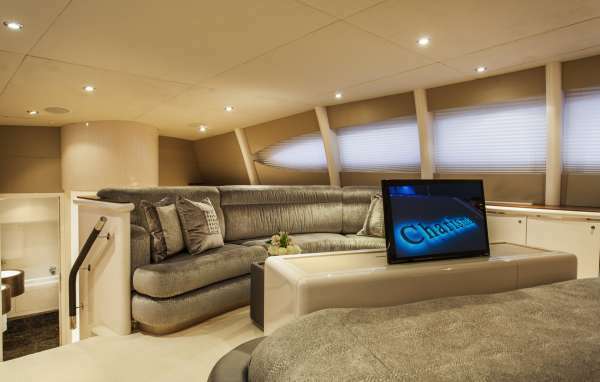 On the lower deck a VIP cabin is forward and full beam of the yacht, with a king size bed, sofa and vanity. 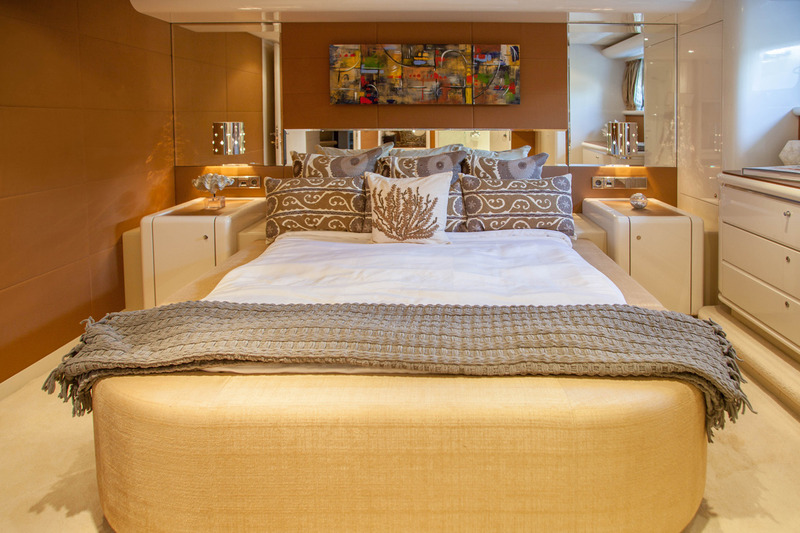 A guest cabin offers a queen size bed and a further guest cabin has side by side single beds. 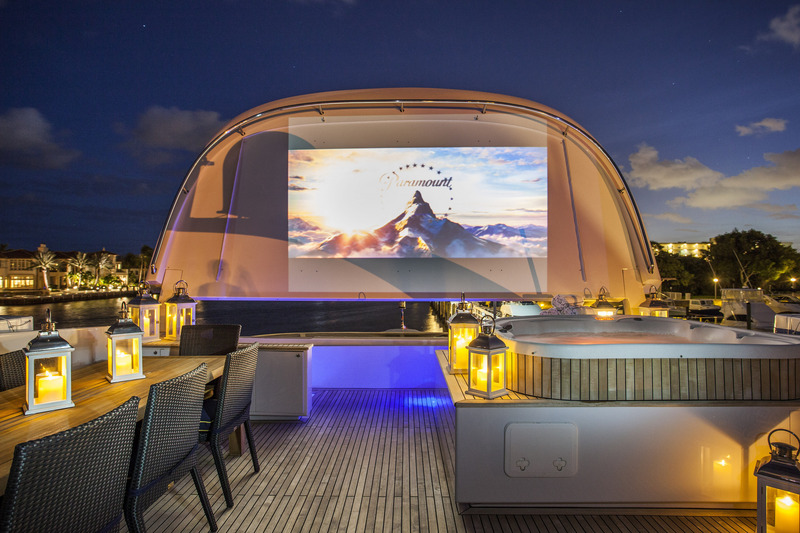 All cabins are light and airy, each cabin features full air conditioning, TV entertainment and private en-suite facilities. 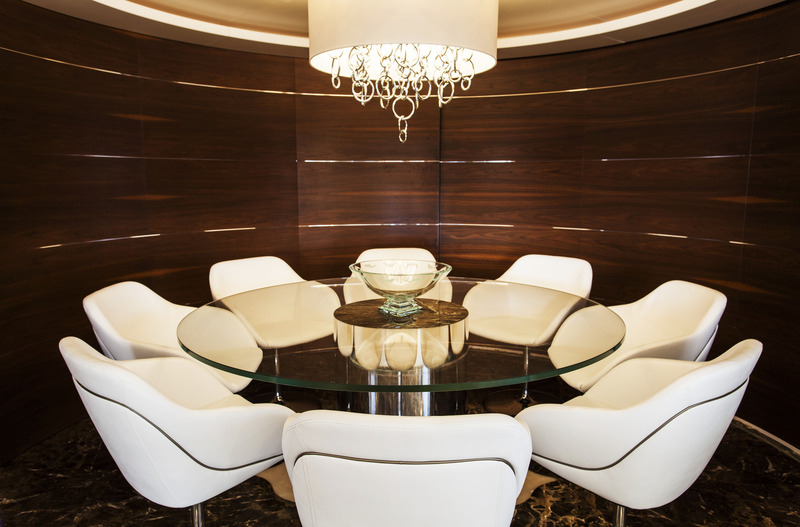 Please inquire for a full list of amenities and water toys.